AEW Executive Vice President Steve Pangori, along with staff members Richelle Grosskoph, Ashley Casey, and Joyce Barnes participated in the 6th Annual Construction Science Expo held on Wed., May 17 at the Michigan Science Center in Detroit. It was the sixth time Steve has volunteered his expertise, and a first-time experience for the other AEW staff members. For the more than 1,000 DPS students, it was an invitation-only, hands-on event created to both expose and encourage them in a future career in engineering and construction. The students had to qualify academically and additionally pledge to be drug-free. 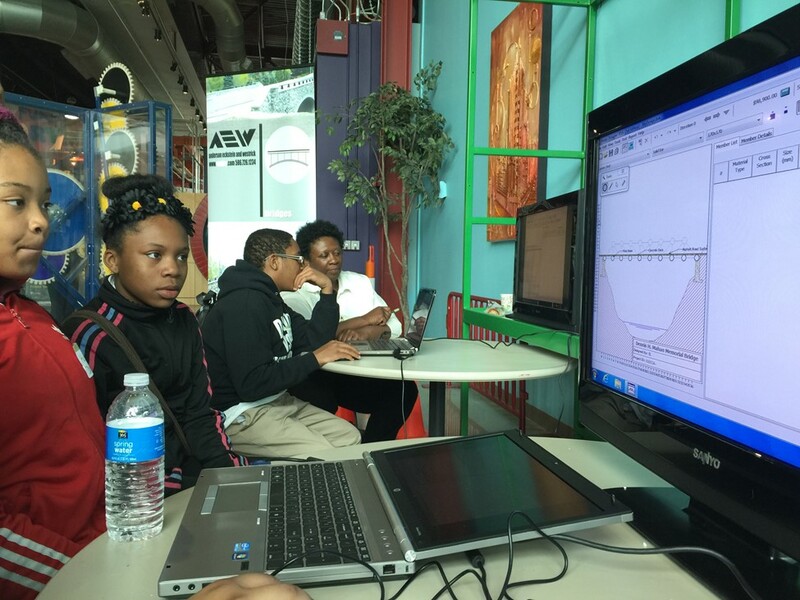 Along with AEW, there were more than 25 collaborating businesses that represented Skilled Trades, Engineering, and Construction, and they were joined by officials of The Black Caucus Foundation of Detroit, Detroit Schools and the Michigan Science Center. This special expo wasn’t a job fair, but an industry-driven, hands-on showcase for qualifying DPS students. Over the past five years, almost 4,000 Detroit students in middle school and early high school grades have participated in this signature event that encourages them to excel in math and science in order to help fill a shortage of talent in the engineering and construction industries. Featuring both indoor and outdoor components, students were able to observe actual work being performed in masonry, carpentry, survey, road and electrical work, as well as the operation of heavy construction equipment. The students could also see others performing real-world construction scenario skits and experiencing engineering centers that included current software and technology developments as well as learning about health and wellness via demos and exhibits. Event speakers included Detroit Mayor Michael Duggan and Michigan Department of Transportation (MDOT) Director Kirk Steudle, P.E.